Tonight offers perhaps the last chance to enjoy new episodes of what, for my money, has been the decade's single greatest sitcom -- Arrested Development. Having been chronically mistreated, poorly marketed, and incompetently scheduled since its launch three years ago, its perhaps fitting that Fox would opt to bundle the final four episodes into one giant bloc, and air them on a random Friday night with virtually no notice whatsoever. But so it goes. BB&T Corporation today said it will not lend to commercial developers that plan to build condominiums, shopping malls and other private projects on land taken from private citizens by government entities using eminent domain. “The idea that a citizen’s property can be taken by the government solely for private use is extremely misguided, in fact it’s just plain wrong,” said BB&T Chairman and Chief Executive Officer John Allison. Now THIS is the kind of "socially responsible investing" I can get behind! Sadly, no. Despite being presented with the tantalizing prospect of naming a television station after a toilet, the planned combination of the WB and CBS' UPN network will, instead, invert the initials and go by the moniker "The CW." Which is a truly craptacular name. It brings to mind "the Country & Western network" or, just simply, "The CoW." Though since one-half of the partnership did spend the better part of a decade trying to get viewers to refer to it as "The Frog," I guess the latter option might be right up their alley. The combination apparently surprised some, but it is clearly a long-overdue move...so long-overdue that it probably comes about five years too late. The WB's once-extensive stable of youth-oriented cult favorites (Buffy, Dawson's, Felicity) is now mostly depleted, and what few franchises they have left with even a modicum of success (Gilmores, Smalville, Charmed) are all either on their very last legs, or getting darned close to it. UPN, meanwhile, was built on Star Trek and wrestling, with the former franchise having petered out quickly in its last incarnation, and the latter seemingly headed into another downward trough in its multi-decadal cycle of popularity. Nonetheless, merging what have long-been two "half-networks" into one whole does hold substantial advantages. The most notable of these is that, by converting affiliates in the many markets that currently only have one or the other, and by picking and choosing the best flagships in each market where they currently compete, the CW will finally be positioned to have something like 95% market penetration. Finally granted that scale, and with a combined line-up that could be every bit as respectable in terms of quality as Fox or, these days, NBC, there just might be a chance for this to catch fire. This one seems to me like a no-brainer pairing. The first is the most commercially successful property the new station will own, despite its position in that crowded Thursday night competition. The second is the most artistically successful property, but it has yet to find its audience. And both appeal to much the same demographic. So you put them together, and hope Clark fans discover Ronnie. And since Veronica Mars tilts a bit more female in audience, it also makes decent counter-program during the half of the year when it would be up against Monday Night Football. Can't be any worse than going up against Lost week after week. Keep the Lorelais where they are. After Smallville, it's the second-most successful WB franchise, so there's no need to muck with it. But OTH does certainly seem a more appropriate pairing than its current partner, Supernatural. But this is probably the last season for both the denizens of Stars Hollow, Conn. and Tree Hill, N.C., so the new network is going to have to milk them for all they can. Perhaps an odd pairing, but it serves a purpose. Supernatural can draw some Lost fans who currently have to sit through weak lead-ins. Beauty and the Geek, meanwhile, is great, dumb fun, and perfect counter-programming for those viewers who don't find ponderous shaggy dog stories to be their cup of tea. Yes, I know what you're thinking. How the hell can those three shows be matched together? Well, my observation is that it's been years since Thursday nights have had a strong block of family-friendly faire. While CBS continues to ride the Survivor/CSI juggernaut, and NBC hopes the adult humor of My Name Is Earl and The Office leads them back to the promised land, why not steal a page from the late Brandon Tartikoff -- the man who invented "must see TV" -- and put together a slate of culturally diverse shows that kids and their parents wouldn't be embarrassed to watch together? Two decades ago, it was the Huxtables, followed by the Keatons. Today, it can be the Rocks, followed by the Harts -- the two most successful sitcoms ever produced by UPN and the WB, respectively -- followed by the most traditional family-oriented drama left in the WB stable, now that the Camden clan will (thankfully) be going off to the REAL 7th Heaven. 8 p.m. - WWE Smackdown! 7 p.m. - Love Inc. It would be unprecedented, but I think it makes total sense. On the night when all the other networks are looking to cater to middle-aged, upper middle class white women, take advantage of UPN's slate of "urban" programming by concentrating just the best and most commercial successful into one big three hour block designed to appeal to young black women. Getting the shitcan: All of Us, Blue Collar TV, Charmed, Cuts, Eve, Half & Half, Living With Fran, Related, South Beach, Twins, What I Like About You. No great losses there. Now, of course, this assumes no NEW programming, which obviously isn't very likely. If Ostroff wants to break some ground here, she might want to finally abandon the old protectionist saw that dictates that British shows can only be imported by PBS, or else must be remade for American audiences. If Americans can accept Hugh Grant and Kate Beckinsale at the movies, then why wouldn't they accept Ricky Gervais and Sarah Alexander in their homes? Similarly, if Friends and Buffy the Vampire Slayer can play on that side of the pond, then why couldn't Peep Show or Marion & Geoff do well on this side? Or, if she wants to be even bolder, she might take notice of the fact the number one rated network last summer wasn't ABC or CBS. It was Univision, a station that still routinely beats both UPN and the WB. HBO experimented this past year with an import of the Argentinian drama Epitafios. Might this be the time for a Spanish-language show on regular American network T.V.? When you're sitting in a distant fifth place, it might not hurt to try. Addendum: The Chicago Tribune's Maureen Ryan offers her own version of the ideal CW hybrid line-up here. I know the Walton family (no, not THAT Walton family) has done its very best to stay true to those small-town, northwest Arkansas roots, despite holding down five of the top eight slots on Forbes' list of richest Americans. That notwithstanding, I fear it just might not be the best business choice to have old S. Robson write the company's press releases himself, as he seems to have drifted just slightly out of touch with the common man's perspective over the years. 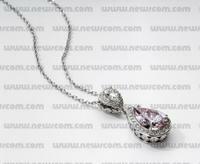 While other consumer retail and designer jewelry stores offer similar fancy colored pieces at prices upwards of $750,000, SAM'S CLUB is making this exceptional pendant with approximately 5 cts of combined pink and white diamonds available to members for the everyday low cost of $560,000. The Justice Department may file suit against the National Association of Realtors (NAR) to prevent them from excluding discount brokers from access to the regional MLS systems. I'm hardly a fan of antitrust but the market for realtors is a racket. Six percent to sell a house? Outrageous! Alex's prime concern is that the commission rates, in his view, do not seem to vary by either time or space. But contrary to his assertion, the traditional 6% isn't traditional anymore, and hasn't been for some time. Nationwide, according to industry research firm REAL Trends, average commissions have fallen from 6.1% in 1991 to 5.98% in 1995 to 5.48% in 2000 and 5.1% in 2003. Commissions are NOT stable, and change all the time. Part of this change is attributable to the buyer's/seller's market dichotomy. Demand for real estate services peaked in the early 1990s, when a particularly acute housing bubble popped, and the market didn't really recover fully until after the collapse of the dot-com bubble in 2000 and 2001. Commissions followed that trend pretty closely, slowly dropping during the recovery years, and then dropping much faster with the start of the housing boom. I haven't seen 2004 numbers yet, but I would not be surprised at all to see average commissions under 5%. When I was selling homes in New Jersey over the past few years, 5% was very much a ceiling, not a floor. The introduction of these very discount web services that are at the heart of the Justice Department inquiry -- Foxton's, et al., who advertise 2% commissions -- has also clearly had an impact, and probably a permanent one. Their services are somewhat different, in that the web sites don't offer open houses, newspaper ads, telephone contact, speakers of foreign languages, or even live agents in most cases. But they do offer a listing, and that's all many homesellers are looking for. As the newer sites catering to "fisbos" -- like forsalebyowner.com -- grow in popularity, it will likely place even more pressure on commission rates. Furthermore, there are several thousand agencies nationwide that offer flat fee-based services. These are especially popular for those looking for fiduciary buyer's agents (there has always been an inherent conflict of interest to a buyer's representative being compensated by splitting a commission, since the higher the sales price, the higher his remuneration) and for higher end sellers -- those whose properties list at $1 million and above. Indeed, in my experience, the 6% standard has NEVER been applicable to the high end of the market, which functions more like the market in commercial real estate. For the chance to represent a seller with, say, a $10 million mansion, not only will most brokers cut their commissions to 1% or 2%, or simply accept a flat fee, but they'll even degrade themselves to go without an exclusive listing agreement. Like the prettiest girl at the party, a high end seller can dance with all the firms she likes, each of whom is just happy to be in the running for the chance to take her home at the end of the night. Unfortunately, no one really understands why commissions are stable. The answer is not monopoly. It's very easy to enter the market for realtors. So why don't commissions fall? Actually, I think a great deal of the price inefficiency in the real estate market CAN be attributed to monopoly. The barrier to entry for real estate AGENTS is low -- typically, it only requires a 90 hour or so class and passing a state test -- but agents are not legally permitted to work for themselves. An agent is an agent of a broker, who holds that agent's license. And the barrier to entry to become a broker is, in most states, typically pretty high. Since it is brokers, not agents, who ultimately set agency policy on such matters as commission rates, that's really where the focus should lie. In New Jersey, where I hold my license, not only must a broker pass a second, more demanding course and test, but he must show he has at least five years of experience as a salesperson, and has been engaged "full time" in the business of real estate for the prior three years. "Full time" is interpreted to mean that the agent did not engage in any other profession for more than an average of 20 hours a week. Since real estate is typically a commission-only business, many agents hold second jobs to provide them with medical and other benefits, and to provide a more steady income. In New Jersey, doing so would permanently lock the agent out of ever opening their own agency, even if they amassed 30 or 40 years of experience. State real estate commissions across the nation are also notorious for enforcing anti-competitive rules that protect the existing class of brokers. It is illegal to advertise commission rates in many states. Anti-rebating measures also abound, as well as restrictions on what sort of promotions you can run. Some states outlaw even the proverbial free toaster. Heck, there are even states where a realtor cutting his commission to help make a deal happen when buyer and seller are close in their demands (fairly standard practice in my experience, unfortunately) would be considered "unlawful sharing of commission proceeds with an unlicensed party"....even though the "party" is the seller himself! If I were looking for an answer to this "puzzle," that's exactly where I'd start. Germans have a full blown case of Popemania now that their native son, the former Joey Ratz, sits upon the Holy See. To commemorate the occasion, Deutsche Bärmeisters Hermann-Spielwaren have introduced a limited edition Pope Benedict XVI bear*, retailing for $200 each. But the fun doesn't stop there. 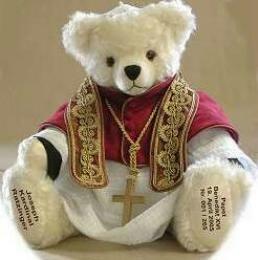 The company also announced plans to design a bear corresponding to every pope in history, 265 in all. Be the first kid on your block to collect the complete set of E.R. Chamberlin's The Bad Popes! As if Clear Channel Communications didn't have enough on its plate, what with its numerous ongoing battles to shut down shock jocks and growing encroachment on its market by satellite-subscription competitors and podcasting, the radio giant is now being force-fed a lesson in Antitrust 101 -- the one that explains how coordination costs and the powerful incentive to cheat doom most all cartel schemes that seek to suppress competition. Mainelli’s survey claims that at least two New York stations appear to be ignoring Clear Channel's "less is more" policy which limits commercial time to 12 minutes per hour during the lucrative morning drive and 10 minutes the rest of the day. The Post logged Q-104 in at 14 minutes and Power 105 at 17 minutes and 15 seconds. Link courtesy of another old Independent Institute buddy, Harry Helms. Hey Harry!